This years Shepherd’s Conference was called the Inerrancy Summit, and it centered around the theme of reaffirming the doctrines of Scripture’s inspiration, infallibility, and inerrancy. Sixteen keynote speakers and several breakout sessions presented messages and lectures confirming those timeless truths. All of the session audio/video will be online at the TMS website. The Vimeo versions of the keynote speaker addresses are available now. All of the key sessions were good, but a few did stand out to me. Steve Lawson’s breakout lecture which was a biographical sketch of William Tyndale was truly moving, and Carl Trueman’s talk on the historical doctrine of inerrancy was a fine debunking to those who claim “inerrancy” is a modern concept and was never believed by the Christian church. Others to consider would be Ligon Duncan, Al Mohler, and Mark Dever reading the entire 119th Psalm; and the Q&A on the background to the Chicago Statement on Biblical Inerrancy was also insightful. The real highlight for me was meeting up with dear saints I know chiefly from social media and spending time with them in real person. I made a special effort to shake Carl Trueman’s hand, which he recounted at his blog. Many of The #15 were there, including Squirrel, Matt Rollings, and JD Hall himself, who made the trip driving down from Montana to LA with his family. I also had the blessed privilege to spend extended time with No Compromise radio host, Mike Abendroth, and his faithful side kick, Steve “Tuesday Guy” Cooley. I also talked with David Wheaton and his brother, and I met up with Jimmy Li who runs the Domain for Truth blog. We ate lunch with Robert McCabe, who teaches Hebrew and OT studies at Detroit Baptist Theological Seminary. There were some young pastors who encouraged me, including Nate Pickowicz who pastors Harvest Bible Church in Gilmanton, NH, and Rick Cowan, who pastors Calvary Baptist in Windsor, Canada. His story is truly amazing as he recounted how he and his church are leaving wild-eyed, barking at the moon independent fundamentalism to sound, biblical orthodoxy and practice. I was truly blessed by his story. We had our first “protester” in a long, long time. He was an angry anti-Kalvanist. Kalvan, according to this guy, was is a heritic from Jeneva. And apparently, I was also embroiled in seething internet controversy with the theonomy folks for my article last week on the debate between JD Hall and Joel McDurmon and with Brannon Howse of Worldview Weekend fame and his ridiculous faux-outrage at Todd Friel. However, the crushing number of attendees overwhelmed the network system to the point I couldn’t follow any of it, so I remained blissfully unaware of any trouble I was stirring up. The thing with Brannon Howse insisting the number of people who died during the Inquisitions was 50 million almost seemed to be manufactured for the sole purpose of getting Todd Friel. The few individuals I spoke with during the conference who were aware of his multiple broadcasts addressing the subject, couldn’t understand why he wasn’t backing down after several corrections of factual error. No one spoke of it in positive terms and believed it only served to besmirch his reputation. But oh well. That was the Shepherd’s Conference to end all conferences, so I’ll be surprised to see what will be tackled next. Of course, I am holding out for a Strange Flesh conference that reaffirms biblical sexuality and marriage, but I don’t see that happening anytime soon. Most of the folks in my orbit of friends, acquaintances, and blog readers, are quite aware of the debate on theonomy that pastor JD Hall had with Joel McDurmon of American Revision, I mean Vision, ministries. Lots of drama swirled around in the lead up to the debate and certainly afterward. Much has already been said on podcasts, written in blog articles, and posted on social media regarding who it was that won the debate. It isn’t my desire to add my analysis on top of the already growing pile of opinions. The debate and the Q&A are online so people can watch both and draw their own conclusions. All I will say is that I think the theonomists crowd, who typically like to pride themselves as being big, bad debaters, were unprepared for JD’s presentation and how their champion advocate stumbled over it. While I will leave the more detailed postmortems to other more capable commenters, I wanted to address one thing Joel mentioned at the finality of his presentation that caused me to do a double-take. He concluded by citing a handful of gotcha quotes from non-theonomists he claims ultimately agree with his views regarding the death penalty set forth in the Mosaic civil law. He begins this one final citation starting at the 2 hour and 22 minute mark. He states how two men, when discussing homosexuality, say that if the American judicial system were to apply God’s punishment for homosexuals, they would be executed. One of the men, Joel’s explains, continues to say how the punishment would equally apply to adulterers and rebellious children. And then comes the big reveal when Joel says how John MacArthur and Phil Johnson agree with the theonomist’s view of civil punishment, not JD Hall and the non-theonomists. Leaving aside Joel mistakenly identifying Phil and John as “Reformed Baptists,” the problem with those scare quotes is that Joel conveniently left off telling his audience where he found them, because if anyone would read the transcript, he will see that John’s comments were surgically revised. He was not promoting some form of inconsistent or even stealth theonomy on the part of Phil and John. Those quotes came from a couple of interviews Phil Johnson did with John MacArthur on homosexuality called, Answering Key Questions About Homosexuality originally released in 2004. Immediately before Joel’s particular citations, John talks about the three fold division of the Mosaic law into moral, civil, and ceremonial. He makes a clear distinction between the three and explains how the moral law, which reflects God’s eternal, moral character, transcends the civil and ceremonial divisions of the law in both the OT and the NT. …[R]emember, Israel was a theocratic kingdom, it wasn’t a democracy, it wasn’t a dictatorship, it was theocratic … The structure of the Kingdom, that is the law of the Kingdom, the constitution of theocratic kingdom was the Law of God. And so naturally whoever it was that enforced the Law of God would be the government, the authority. And it would be the priests who knew the Law of God and represented the Law of God who therefore were the officers of the theocratic kingdom … So in this theocratic kingdom, God established penalties for violations of His moral law. And this was a model of a perfect environment, a theocratic kingdom … Thirty-five different moral violations were punishable by death. One of them was homosexuality. 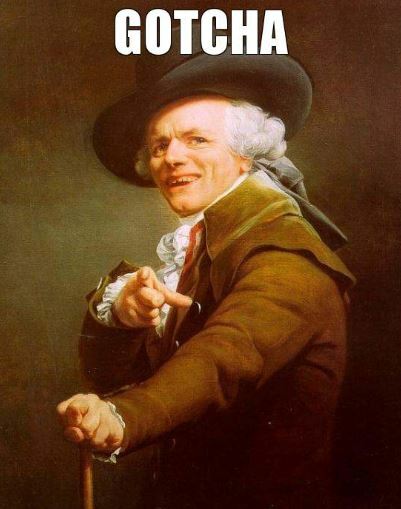 Just to spread that a little bit, another one was disobeying your parents. Following that paragraph comes the comment Joel cites from Phil about how execution for disobeying our parents would certainly cut down on the number of delinquents. But then Joel cites John as saying that if we were to do what was right in America, we would execute homosexuals, and he turns that comment into John unwittingly agreeing with his theonomic visions. The tragedy is, however, the theocratic kingdom which God originally established began to disintegrate very early, didn’t it? I mean, it didn’t take very long. When God established His law, it wasn’t long until the people began to fall into sin, they made all kinds of promises that they didn’t keep. They disobeyed the Ten Commandments all over the place … And what you had then was an unwillingness on the part of those who were responsible for the theocratic kingdom to enact the civil punishments. And because there were no punishments for these kinds of sins, they flourished everywhere, adultery, fornication, immorality, homosexuality, baby sacrifice, offering your children to Molech, etc., etc., etc. Note my emphasis. John wasn’t saying the punishment of death was unjust. Not even JD was saying that in the debate. The punishment meted out by civil magistrates, however, is applicable in a theocratic kingdom ruled by God. And seeing that a physical, national, theocratic kingdom currently does not exist yet because Christ has yet to come to establish it for a 1,000 years, we don’t execute people for the sin of homosexuality. At this time and place, during this *GASP* dispensation, there is a reprieve that God grants. But every person who violates God’s moral law will eventually get what he deserves in the end. That’s the key. So it’s not a pretty sight when men try to turn an earthly government into some kind of reflection of the divine kingdom. There will be that kingdom and when will that come? When Jesus returns and establishes His earthly kingdom. And that is promised in the Bible. The kingdom will come and the Lord will rule with what kind of rod? A rod of iron, He says, and at that point sin will be punished the way God has always deemed that it should be punished, swiftly and on the spot. And those sins which are worthy of that kind of punishment will receive it, no matter what the sin is, whether it’s homosexuality, or anything else, from the very outset God has provided forgiveness, salvation and the hope of eternal life to those who repent and embrace the gospel. I just want to say that 1 Corinthians 6 says, “Such were some of you.” You were homosexuals, you were effeminate, you were adulterers, you were liars, it goes on and on, but you were washed and you were cleansed. And that’s what the Lord Jesus offers. We’re not trying to bring damnation on the head of homosexuals, we’re trying to bring conviction so that they can turn from that sin and embrace the only hope of forgiveness and salvation for all of us sinners, and that’s through faith in Jesus Christ. Thus, contrary to McDurmon’s assertion that John and Phil inadvertently support his theonomic view of the civil, judicial punishments prescribed in the Mosaic law, He does no such thing. Though he affirms the death penalty for sinners violating God’s moral law, John recognizes that the civil magistrates executing someone for violating that law isn’t the norm for human governments at this time. That is a radical departure from theonomy. I guess now that Corey has liberated himself from the ironclad bars of Fundamentalism, he no longer feels obligated to be honest with the facts. Particularly if the facts wreck the fantasy mythos of his previous Fundamentalist dark ages. Go back and watch that video. Corey’s post is so wildly dishonest as to what John said, a person has to seriously wonder if he ever really watched it at all or if he is intentionally lying and banking on the hope that none of his readers will care enough to make the effort to go watch for themselves and complain against his falsehoods. John MacArthur was recently asked by a reader how they should respond to an adult child who has acknowledged they are gay. His parenting advice? Refuse to have a meal with them. Turn them over to Satan. That is not at all what John stated. John differentiated between two types of individuals: Those who are professed believers who claim to be gay and those who are not believers who claim to be gay. Corey ignores those distinct categories so he can make John out to be a Fred Phelps bigot. However, John clearly explained that if a child (keep in mind, an adult child; not an 8 year old whose parents abuse him by forcing him to go to a cross-dressing camp) who professes Jesus as Lord and Savior, but claims also to be a homosexual, is to be treated according to the commands of 1 Corinthians 5:1-11. Yep. I know. Those hard sayings in the Bible that I guess rub Corey the wrong way so badly that the only options we have is to either reinterpret them or ignore them all together; or maybe take the Bart Ehrman approach and pretend Paul never really wrote 1 Corinthians. But as is typical of Ex-Fundamentalist bloggers congregating over at the Pathos webhub these days, along with selective video editing, Corey also lacks reading comprehension skills, especially when it makes his Fundamentalist target look like an unsophisticated moron. One of the key passages folks use to support shunning comes from 1 Corinthians 5– the unfortunate truth, however, is that Paul lists several sins he thought were shun-worthy. Folks like MacArthur have lifted sexual immorality out of that passage while completely ignoring the rest of what Paul taught. No. John has not “lifted” anything out of context. The point of Paul’s admonition in 1 Corinthians 5 is to address a sexual fornicator who was brazenly participating in the fellowship of the Corinthian church who claimed to be a believer. The fact that this guy claimed a relationship with Jesus Christ yet participated in fornication is the problem and the case for him being removed from the fellowship. I thought former fundies and survivor types were all up in arms against sexual abuse, but I digress. Because it would be horribly inconvenient to actually practice this verse. In it, Paul teaches that we are to have nothing to do with Christians who are… greedy. Which in America, is a whole lot of us. I wonder if MacArthur would also suggest you shun an adult child who makes $200,000 a year but doesn’t tithe or give any of their money to charity? Somehow, I doubt it. Really? I doubt this guy has done any serious study of that passage. Heck. Why should he? He doesn’t believe the Bible is inspired anyways, so why waste your time on any meaningful Bible study? But for those who truly want to know, the idea of greedy isn’t someone who happens to be wealthy and doesn’t give his money to charity. The word has to do with extortioners or racketeers who take advantage of the needy so as to enrich themselves. The rich Republican guy (as we play into Corey’s stereotype) who earns his money honestly but doesn’t give to charity is nowhere in view. It has more to do with con-artist hustlers who prey on the disadvantaged for their own gain. More like environmentalists or the Health and Wealth crowd than anything else. I wonder if MacArthur would teach that we should isolate, alienate, and turn over to Satan our children who struggle with over-eating? That can be a form of greed because it is taking more than you need. I include this only to show how embarrassing Corey’s argumentation is. If he thinks overeating is equivalent to the greed Paul is addressing he disqualifies himself as a serious commentator on Christianity. He should be ignored. Or, what about the idolators mentioned in that same passage? I know a boat load of Christians who are trusting in firearms for their safety instead of God– which is idolatry. According to Paul, they should be shunned as well. Ah yes. Gotta work that anti-gun smear in there somehow. Again, the idolatry that Paul is addressing is religious idolatry. It is the worship of false gods, or the application or practice of false doctrine in the manner that it creates its own pseudo-Christian, religious worldview. The kind of idolaters who openly lie against those they oppose and who compromise with the pagan element of the culture that warmly embraces and gives affirmation to sexually deviant behavior. Say like, homosexuality. Is John MacArthur’s appearance on TBN really the same as Michael Brown’s interviews with Benny Hinn? Michael Brown insists that for many years he has been one of the loudest critics of the crazy antics that are prevalent among prosperity teachers and televangelists. Those outlandish behaviors John MacArthur identified in the Strange Fire book as being the “charismatic norm” are really the fringe minority according to Brown. When he announced a series of televised interviews with Benny Hinn, many people were left wondering about his decision. Since he is a vocal critic of such scandalous, ungodly behavior among professed charismatics, why would he willing lend credibility to the most recognizable prosperity preacher of our day who engages in the propagation of those elements that Brown says are fringe? In order to do damage control in the aftermath of his announcement, a few of Brown’s online cheerleaders have attempted to put a happy face on what truly was a profound lack of judgment and display of inconsistency. Frank Viola, for example, posted an article dismissing any criticism of Brown’s appearance as coming from people who are making faulty “guilt by association” arguments. Michael Brown doesn’t endorses Benny Hinn any more than MacArthur endorses all the folks who appeared on Larry King Live when he was a panelist on his program. Though Frank may think that is a sophisticated response, it is a ridiculously moronic comparison. The two are nothing alike. Larry King Live was a secular media program. Benny Hinn claims to represent and speak on behalf of God. Compounding his absurd comparisons, Viola updates his post with some comment pointing out that MacArthur once appeared on TBN. Because TBN airs Benny Hinn’s program the “guilt by association” arguments must be applied equally to him like they are to Brown. Additionally, John attacks TBN, so his interview drips with hypocritical inconsistency. It’s IRRELEVANT who interviewed MacArthur on TBN, because MacArthur CONDEMNS TBN out of hand. So trying to split hairs on this inconsistency and make excuses for MacArthur will not fly. It is true that John once appeared on a TBN aired program back in 2004. In fact I’ll embed the video so folks can see it for themselves. Contrary to the spin Frank tells his fans, it is extremely important who interviewed him. There is a clear difference with John being interviewed by Kirk Cameron, who once had a working relationship with TBN (and may still have as far as I know). Kirk doesn’t teach a false Gospel, nor has he robbed millions of people over the years of their money and dignity by promising healings he could never perform in the first place. Moreover, and again, contrary to what Frank writes, where John was interviewed is irrelevant. It doesn’t matter if he has been and still is extremely critical as to what TBN has broadcasted over the years. John went there once at the request of a friend and took his one shot of presenting the biblical Gospel to a watching audience who for the most part adhere to a false gospel. Benny Hinn is on TBN all the time, shilling for money, particularly during their “praise-a-thon” fund raising weeks. And, John was very much aware of the ramifications of his decision to appear on a TBN sponsored program. Hence the reason he appeared in an extremely “controlled” environment hosted by a guy he knows is a solid, non-Health and Wealth individual. If Brown’s supporters genuinely believe his appearance schmoozing with Benny Hinn is the same as John’s one time appearance ten years ago on TBN with Kirk Cameron, I have to seriously wonder about their ability to discern. ….Where exactly do you go from here? Shortly before the Strange Fire conference, maybe a week or so, I was directed to this absurd video. 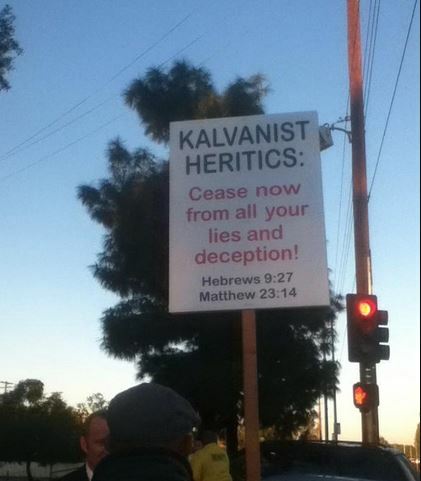 It was put up by some anonymous outfit called the Ephesians 5:11 blog. Now. Let me pause here just a moment and give everyone a solid rule of thumb about that kind of stuff you may find on the internet. IF the person making such-and-such a wild-eyed, crackpot claim is anonymous and when pressed, refuses to tell you who he is or where he goes to church (if at all), you can confidently concluded that 10 times out of 10, the person is probably a wacko and can be safely ignored. I have a sneaking suspicion that this particular individual is more than likely Bob Johnson, or perhaps a minion of his, who was notorious for standing out in front of Grace Church warning us how Al Mohler was a Jesuit, U.N. spy who was sent to infiltrate the church to usher in the new world order. I document my dealings with Bob HERE. At any rate, the person could be just some tin-foil hat style KJVO loon for all I know. Whatever the case, going into the Strange Fire conference, I was seeing talk about the video on Facebook and figured I’d get questions about it. And sure enough, on the last day of the conference, I had a long discussion with some precious folks about the video that led us into some terrific fellowship. If anything else, I have to say the one good thing about that video was the fact that I met some wonderful people who are now some acquaintances on Facebook who I look forward to fellowshipping with in person in the future. When I spoke with Phil about the video, he said we’d revisit it sometime after the conference. Well, it just so happens the Monday morning following Strange Fire, John came out to GTY to do some recording and we all had a chance to bring up the video with him. His first response was, “Oh yeah. Someone asked me about that after one of the sessions.” We asked him how he would respond now and whether or not his view had changed since he had preached through the book of Revelation, and to my surprise, he basically affirmed what he said in that Q&A some 30-plus years ago. That being, that during the seven year tribulation, when people are deceived by the Antichrist to take his mark in order to survive in his “society” (Revelation 13:16,17), but then later, upon hearing the Gospel preaching of the 144,00 and the call of repentance as heralded by the three angels (Revelation 14:1-13), many of those people who took the mark can and do repent and follow Christ, and thus are saved. By the way, a lot of this assumes the “mark” is some physical thing a person can take to himself. Say for example, a microchip or a barcoded tattoo. So in John’s view, the taking of the mark during the tribulation is not a final, absolute certainty of damnation that seals and fixes the eternal destination of the person. 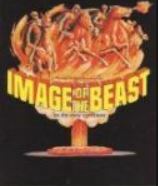 In fact, if one were to read Revelation 15:2, the idea of victory over the mark of the Beast is clearly implied, And I saw something like a sea of glass mingled with fire, and those who have the victory over the beast, over his image and over his mark and over the number of his name, standing on the sea of glass, having harps of God. Couldn’t that “victory” spoken about be those who may take the mark, repent upon hearing the Gospel, and will then be saved? And, according to the verse, it seems to suggest that they are executed for their actions of rejecting the mark thus becoming martyrs. So the idea of what John is saying is not far-fetched and without warrant from the biblical text as those wack-a-doodles suggest in their video when they write OUTRAGEOUS! It certainly exposes the fact that they are merely haters and haven’t even thought through what is being taught in Revelation. Well, once John gave his affirmation, Phil wrote up a response affirming what he originally stated and explaining his view a bit more and providing an “official” statement to all those folks out there wondering what he thinks about that video. Okay, so with that being said. Where do you go from here? Now I certainly can’t make any appeal to the makers of that video. Those are individuals who are the modern day equivalent of Ishmael with their hand against every man (Genesis 16:12). They live in a fever swamp of conspiracy and foggy theology where no rational thought can even dare bubble up to the surface. There will always be people who are so OCDed against John MacArthur like Bob Johnson and fake pastor-teacher, Joel Taylor, that anything he will say or do will be declared heretical. Those people cannot be reached. Now for the rest of you all out there who have actually benefited from John’s preaching over the years, are you prepared to throw John’s ministry under the bus because of an idiot video on Youtube and conclude all of that blessing you experienced was a sham? Really? Think about it: John has had 50 years of solid, Bible teaching ministry that has reached around the globe. I’ve met people from the farthest reaches in the world who testify how they were in a rural rice patty in Vietnam or some tundra landscape in northern Russia listening to John MacArthur tapes on a walkman or Grace to You on a handheld radio and it was in those circumstances God brought them to salvation by the preaching of the Gospel and the consistent teaching of God’s word. His study Bible has been translated into Arabic, the only genuine Study Bible to have been so; and the Chinese version is coming sometime in the next year. John was the guy on Larry King Live who irritated to no end Deep-pockets Chopra when he told him there was only one way to God through Jesus Christ alone and that the NT was originally written in Greek, not Aramaic. So along comes a crank with a Youtube video that says that everything John has ever done or ever preached over the last four decades is totally worthless, just because he has an out the ordinary view on a speculative understanding of the mark of the Beast. It is at this point where people need to stop and determine if they are going to dismiss such moon-battery. Seriously. 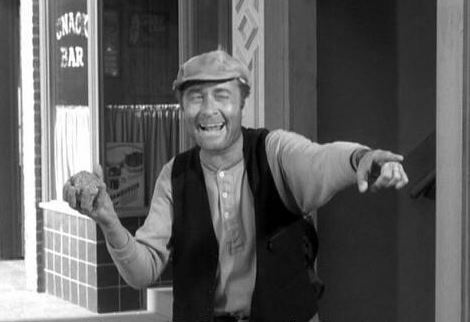 Please don’t join the Ernest T. Bass’s of the internet with hurling rocks through church windows.